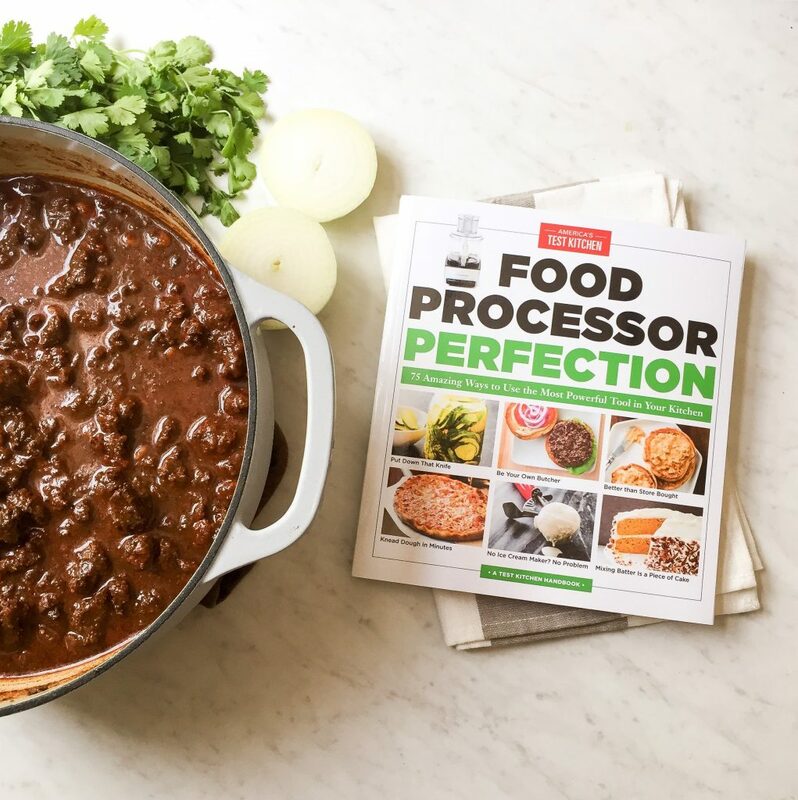 I’m SO excited to announce America’s Test Kitchen‘s latest cookbook Food Processor Perfection!! I’m going to be honest with you… I’ve had a food processor since we got married almost five years ago, and I just use it for the basic things! I’ve never used it beyond things you’d typically use a food processor for: making hummus, almond butter, falafel, occasionally salsa… I’ve definitely never felt comfortable using the accessories for my food processor or going beyond the basics! …until this book! It has so many applications for how to use your food processor- I’m loving it! It’s been saving me SO much time in the kitchen! And they let me share a recipe with you! 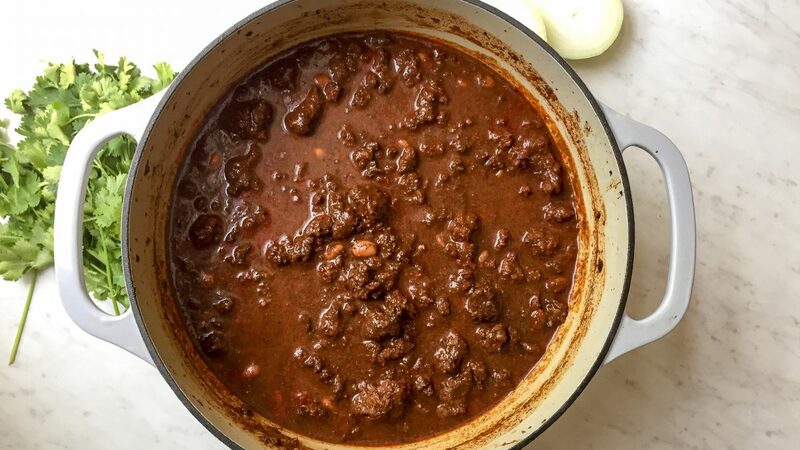 This Home-Ground Beef Chili Recipe is soooo yummy. You use your food processor to ground your own beef! It’s pretty reassuring knowing that your ground beef is only made with chuck-eye roast. You also make your own taco seasoning with ancho chilis… they add SO much flavor to this chili! If you want to make this recipe fully paleo (as is it has corn tortillas and a can of beans), you could sub in 1/4 c almond flour for the tortilla chips and omit the beans! I know adding a ton of yummy veggies would be delicious in this, too! Once we’d developed a foolproof method for using the food processor as a meat grinder, we turned to one of our favorite ground beef recipes: thick, spicy, ultrabeefy chili. 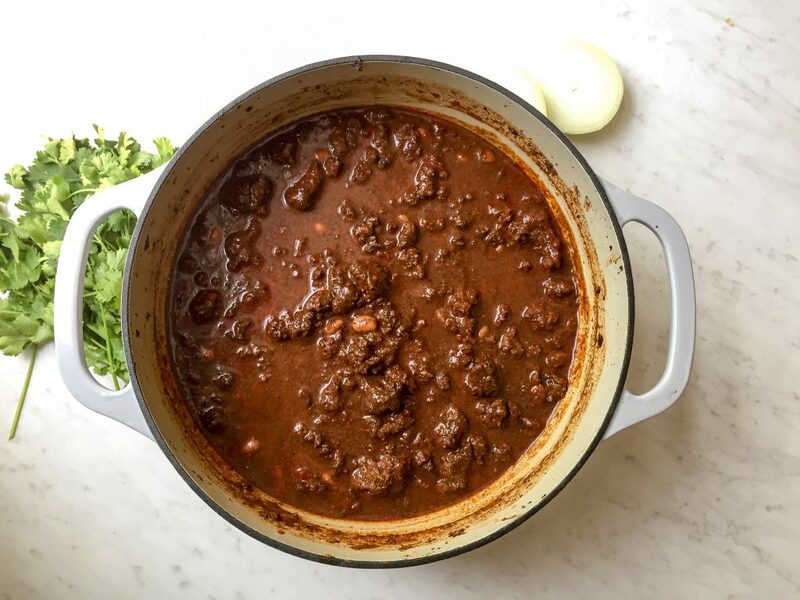 Making our own ground beef from meaty chuck roast helped give the chili all the hearty texture and juiciness of a traditional chili made with chunks of beef. And we didn’t stop there- we also used the processor to make our own chili powder out of toasted dried ancho chiles, chipotle chile in adobo, and paprika, along with a blend of herbs and spices, and ground tortilla chips for added thickness and toasty corn flavor. To keep the meat moist and tender, we treated it with baking soda, which kept the meat from shedding too much liquid during cooking. To further highlight the beef, we kept filler to a minimum, using only small amounts of pureed whole canned tomatoes and pinto beans. We also made sure to stir in any fat that collected on the top of the chili before serving since it contained much of the flavor from the fat-soluble spices in the chili powder. To save time, prepare the other ingredients while the beef is in the freezer. This chili is intensely flavored and should be served with tortilla chips and/ or plenty of steamed white rice as well as your favorite toppings. Arrange beef in single layer in rimmed baking sheet and freeze until very firm and starting to harden around edges but still pliable, about 35 minutes. Meanwhile, place anchos in Dutch oven set over medium-high heat and toast, stirring frequently, until fragrant, 4 to 6 minutes, reducing heat if anchos begin to smoke; set aside. Sprinkle baking soda evenly over meat. Working in 6 batches, pulse beef in food processor until finely ground into 1/16-in pieces, about 20 pulses, stopping to redistribute meat as needed; transfer to bowl. Add anchos, tortilla chips, cumin, paprika, garlic powder, coriander, oregano, thyme, 11/2 teaspoons salt, and 2 teaspoons pepper to now-empty processor and process until finely ground, about 2 minutes; set aside. Pulse onion and garlic in again-empty processor until finely chopped, about 8 pulses; set aside. Process tomatoes and their juice in again-empty processor until smooth, about 30 seconds. Adjust oven rack to lower-middle position and heat oven to 275 degrees. Heat oil in now-empty pot over medium-high heat until shimmering. Add onion mixture and cook, stirring occasionally, until softened, about 5 minutes. Add beef and cook, breaking up meat with wooden spoon, until browned and fond begins to form on pot bottom, 10 to 12 minutes. Add ancho mixture and chipotle and cook, stirring frequently, until fragrant, 1 to 2 minutes. Stir in water, beans and their liquid, sugar, and tomatoes. Bring to boil, scraping bottom of pot to loosen any browned bits. Cover, transfer pot to oven, and cook until meat is tender and chili is slightly thickened, 11/2 to 2 hours, stirring occasionally to prevent sticking. Remove chili from oven and let sit, uncovered, for 10 minutes. Stir in any fat that has risen to top of chili, then add vinegar and season with salt to taste. Serve. Be sure to head to my Instagram page tomorrow for a giveaway of their new cookbook! !